It takes just 10 minutes a day to complete a brain training workout. And, with 45 brain games for adults, and new brain training workouts every day, there is always a fun challenge waiting for you. Researchers at the University of Cambridge have developed a brain training app that can improve concentration against daily distractions that people face in a connected world. With brain games made in partnership with academics from leading universities like Cambridge and NYU, and more than 12m downloads, Peak is the ultimate brain training experience. 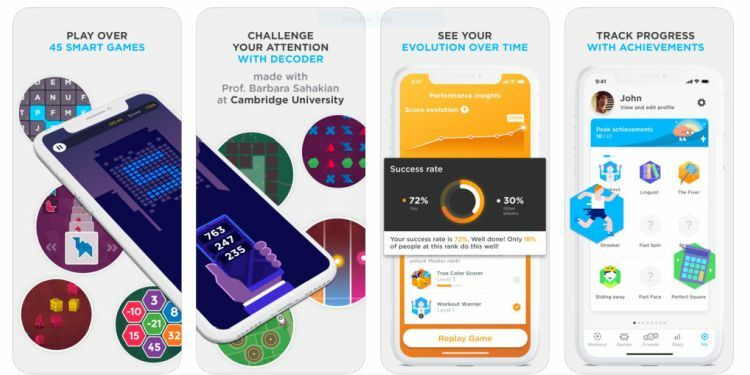 The app called ‘Decoder’ has been incorporated by developer Peak as part of its Peak Brain Training app on iOS, with an update coming for the Android app soon. The app claims to give users improved attention and concentration scores by training for eight hours over a month. Peak is the fun, free brain training workout designed around you. Peak uses brain games and puzzles to challenge memory, language and critical thinking to keep your mind active. Researchers from the Behavioural and Clinical Neuroscience Institute at the University of Cambridge divided 75 healthy young adults into three groups: one group received “Decoder”, one control group played Bingo for the same amount of time and a second control group received no game. Those who played Decoder for a month showed much improved results when tested at the end of the trial, than when they were tested at the start. “The difference in performance was significant and meaningful as it was comparable to those effects seen using stimulants, such as methylphenidate, or nicotine,” the team says. Designed in collaboration with experts in neuroscience, cognitive science and education, Peak makes brain training fun and rewarding. Peak’s scientific advisory board includes Professor Barbara Sahakian FMedSci DSc, Professor of Clinical Neuropsychology at the University of Cambridge. Free brain games to challenge your Memory, Attention, Math, Problem Solving, Mental Agility, Language, Coordination, Creativity and Emotion Control. Learn which categories your brain excels in, and compete with friends by comparing your brainmap and brain game performance. Coach, the personal trainer for your brain, helps you track your progress and improve. Cognitive brain training with games from expert researchers at Cambridge University, NYU and more. Works offline so you can enjoy Peak brain games wherever you are. Selected by Google as Editor’s Choice. More than 45 brain games available and regular updates to keep you challenged. Get personalised brain training workouts and in-depth insights with Peak Pro. Get access to Peak Advanced Training modules: intensive programs that train a specific skill, including the new Wizard memory game created with Professor Barbara Sahakian and Tom Piercy in the Department of Psychiatry at the University of Cambridge. You can try Decoder in the free Peak – Brain Training App on iOS. The app is also available on Google Play for free, but Decoder has not been added to its training modes.